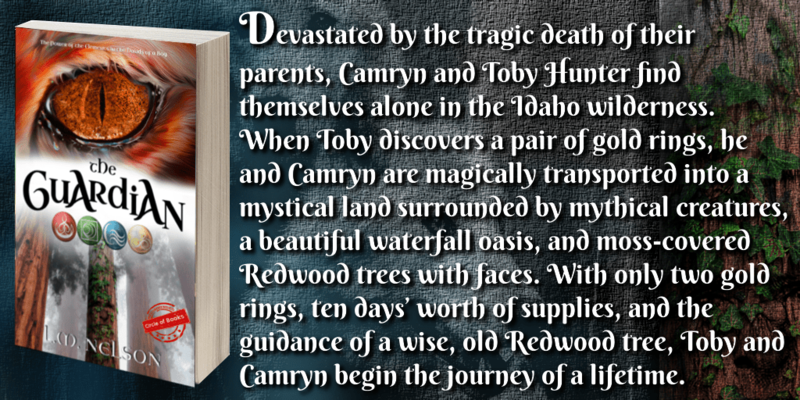 After a tragic turn in which their parents die, Camryn and Toby Hunter are left on their own in the Idaho wilderness. Toby discovers a pair of gold rings and he and his sister are magically transported into a mystical land. Their only known exit is immediately blocked and they find themselves surrounded by mythical creatures in the land of Gelnoff. Toby is named as “the Guardian” by the locals and is faced with a life-changing task. “Scrubs is a YA novel about a group of college students. The story focuses on Randy, a medical student, and his romance with Jane, a psychology student. The timeline begins at the start of Randy’s second year of med school, and concludes just days after his graduation. The author does a realistic job of depicting the enormity of commitment necessary to succeed in the medical field. She also weaves into her story several other components of a med student’s life: fear of failure, fatigue, family sacrifice, and attrition. Nelson does an EXCELLENT job of handling multiple characters. In fact, although Scrubs holds almost nothing in common with Gone With the Wind, Nelson is comparable to M. Mitchell in her ability to juggle several characters. Effortlessly, the reader is able to meet multiple distinct personalities. A young heroin addict, an older bereaved widow, sorority sisters, and darling toddlers all come to life for us. “Randy Hanson is a second-year medical student immersed in his life of classes, study groups, and one-night stands. But that part of his life ends abruptly when he meets Jane, a gorgeous young psychology student. Soon, he has to find a way to balance the increasing demands of his medical training with his burgeoning relationship with Jane. The focus is on the toll that the time and effort involved [with medical school] can take on the people and their relationships. Obviously, the main one is the relationship between Randy and Jane, which is followed from first meeting to marriage, although others are given some attention as well. One of the things I liked best about Scrubs is the descriptions and examinations on the personal lives of the main characters. There are problems with family; parents, siblings and in one case, children; problems with significant others, teenage angst, and as mentioned above problems with the pressures and workload involved. Most of the main & supporting characters are given very believable issues to deal with throughout the course of the novel. The book covers a span of four years or so, and during that time we see some people drop out, some people change for the better (and occasionally for the worse), and most grow into their chosen roles. Voted 2017 Texas Authors Medical Fiction book of the year. “I LOVED THIS BOOK. Let me tell you why. Now, while we are on the subject of characters, OH, THE CHARACTERS! I quickly became emotionally involved and invested in each character. I find this to be a great asset to a story and an impressive skill on the part of the author. My feelings regarding these characters are as such: I always want to be able to pick up a Scrubs book, check in and see what’s happening in their ever evolving lives. Are they well? How are the kids? They must be growing up fast, can’t wait to see them in the next book. I want to send Randy Hanson a nice coffee basket for Christmas; I know he would love it. I wonder if so and so ever got over that difficulty they were having. I also realized that these characters are universal in appeal. “Scrubs” is a book series that will be enjoyed by men and women alike, the young and old, people from all walks of life. A magnificently written, read at your own pace because the pace in the book will always be consistent with unforgettable characters and compelling, ever changing story lines. [It] would make a great gift because of the book’s universal appeal and exceptionally good writing. There are two other very prominent characters in Sand & Sutures and I suspect in all of the books in the Scrubs series that have no dialogue. The first quiet but ever present character is the city of Seattle, Washington. You can feel the green, picture the fog, sunshine and rain. The features and terrain of Seattle have been lovingly and subtly written in as the characters walk through their days. It now comes as no surprise to learn that the author spent a great deal of time in Seattle and I have a feeling she loved it because it feels loved in the reading. The second character is the medical profession. All of the details of what happens in a hospital setting, in neurosurgery, in the field of an OB GYN is so good, so spot on, completely relatable and not too technical. At no point in this book does the backdrop character of the medical profession feel “researched” or foreign. Nor is it ever overdone or under done, purely well done. The medical environment in which the book takes place felt so natural. Beyond the Hardwood was nominated for the Circle of Books 2017 Ring of Honor Awards. Center Stage was nominated for 2017 Reader’s Choice Award.